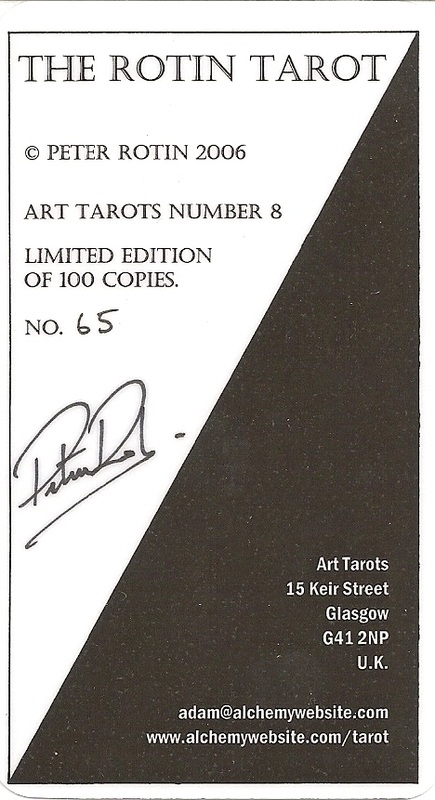 The Rotin Tarot is "Art Tarots Number 8" from Adam McLean's Artwork Tarot Series. 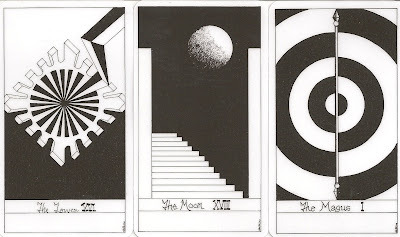 It has 22 minimalistic cards that work with the polarities and dark and light. 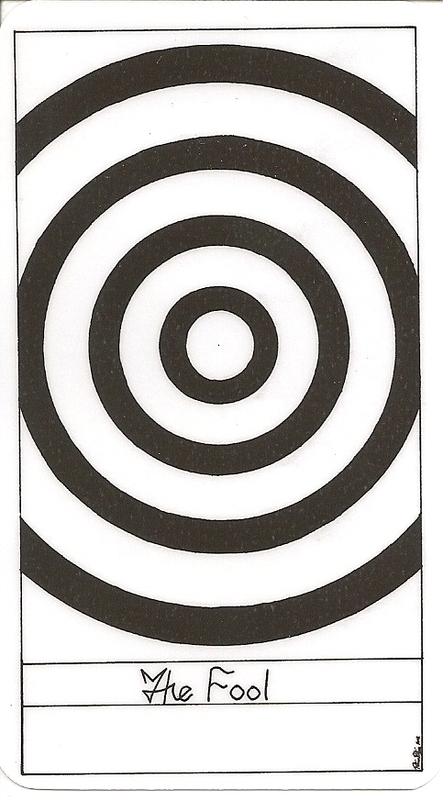 The Rotin Tarot contains black and white line drawings in ink, pencil and pen surrounded by a thin black border line. A double box at the bottom of each card contains the card name followed with the appropriate Trumps number. The cards follow the generally accepted Marseilles numbering system (Justice 8 and Strength 11) with no number printed on “The Fool” card. 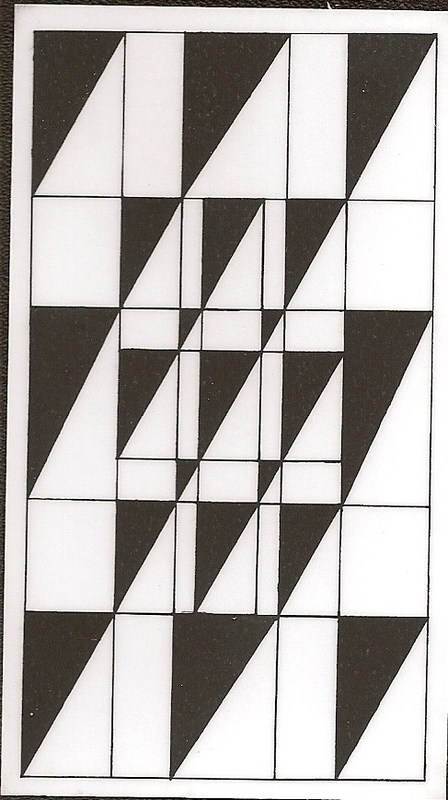 The card backs are an evenly split black and white diagonal that would indicate a reversed card. "I was always fascinated by the fact that The Fool is unnumbered, giving it a certain ambiguity in the flow of the Tarot. A couple of years back when I was studying the Tarot, I came about a book on numbers and another on buddhism about the importance of the discovery of the number zero by human kind and the importance of the concept of emptiness for buddhists. It was quite revealing at the time and helped me piece many thought processes together. What I tried to do with the front card was simply that. There are 21 cards drawn on the card but the card in itself is another card, becoming the 22nd one. It exists when the other 21 exist, a concept of buddhist interbeing. The Fool is the most important card in the deck, it is the beginning, the end, and the reference point of all the other cards. Like the number zero, it has no apparent value unless one is ready to understand that without nothing you cannot have something, that emptiness is the root of all being. "